Visiting pubs just recently has been an interesting experience as I’ve been unable to drink beer for a while because of some medicine I’m taking. This has presented me with a little bit of a challenge and has highlighted just how much alcohol consumption is taken for granted in pubs. This post outlines my experiences of attempting a social life without the wonderful choice of real ale that I usually enjoy. Research carried out mainly in London. But They Sell Fruit Juices Don’t They? Sure, fruit juices are available but they all tend to be a bit sweet and I resent paying extortionate prices for either a miniscule mixer bottle, or for something that could be bought for a fraction of the price at the local supermarket. I wanted something that was a bit more ‘adult’ tasting than that. Initially I started drinking lime juice with soda water which is quite refreshing but can get a bit dull after a while – except when it’s done well. So step forward the Charles Lamb in Angel and the Harp in Covent Garden who were happy to make me lime and soda with juice from real limes – and without charging me the earth for it. One snag with lime and soda is that pubs seem to love to give you masses of ice – fine on warm summer evenings, but an over-chilled experience on cold autumn evenings. In fact all non-alcoholic drinks seem to be served as cool as possible and with some options you find out why. Since I was a child I’ve always loved ginger beer and there are a number of makes available. I found ginger beer to be more satisfying than lime and soda but expect to pay a good price for it – in one north London pub my 330ml bottle of Hartridges ginger beer was more expensive than a pint of real ale! Not all pubs carry ginger beer but where it is available the most common makes are Hartridge’s and Fentiman’s. Both are not bad but my favourite was a can of Old Jamaica ginger beer from the Barnsbury in Islington – somehow the canned version tastes much better than from a plastic bottle from the supermarket. When asking for ginger beer you do have to be careful as some pubs now carry alcoholic ginger beer – which I’m sure was delicious but unfortunately ruled itself out of my survey. Other drinks in this line included Fentiman’s Dandelion and Burdock which I tried at the Drapers in Islington. Once again not a cheap drink but actually quite tasty when you get past the odd and slightly icky smell. There’s always something different about the taste of a non-alcoholic beer – something unreal. Maybe it’s part of the process that strips the alcohol out, or maybe it’s just that the alcohol gives that special oomph to the flavour. Before this year the last non-alcoholic beer that I drank was Kaliber which I seem to remember was disgusting. Happily things have moved on in a positive direction. But amazingly a large number of pubs just do not bother stocking alcohol-free beer. This seems odd to me but what do I know? More frustratingly some pubs do feature non-alcoholic beer on their price lists but when you ask for it they’ve sold out. However I did find a couple pubs that do actually carry alcohol-free beers and the experience was generally pretty good. 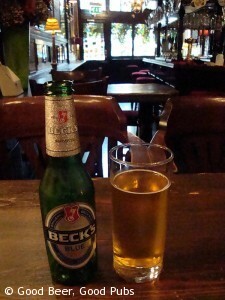 The most common non-alcoholic beer in pubs seems to Becks Blue – a lager style beer as you would expect. It comes in tiny 275ml bottles so you’ll need two for it to feel like a pint – but that may set you back a bit. Overall the taste is pretty good – much better than I was expecting. So well done to the Crosse Keys – a Wetherspoon’s pub in Gracechurch Street and the Harp (again) for carrying it. I was also looking forward to trying Bitburger Drive – another non-alcoholic lager that comes with a good review, but the only pub where I saw it advertised (the Dispensary, Aldgate) never seems to actually have it. **Update** They sell it at the Cobweb Inn in Boscastle, Cornwall. Another impossible to find brand is Stella NA – which also gets a good review here. If you think non-alcoholic lager is hard to find in pubs the try looking for a more ale experience. Many years ago when Whitbread was a fairly successful brewing company instead of the hotel and restaurant chain of today they produced a non-alcoholic real ale called White Label. I found it on draught in a couple of pubs in Kent and I drank it on occasions when I was driving. It was a brave attempt at a real beer but unfortunately unremarkable and it didn’t seem to last very long. The best I came up with during my current ‘survey’ was at the excellent Royal Oak in Borough. I was offered two different bottled beers by Harvey’s that were allegedly alcohol-free – but which on further investigation turned out to be 1% alcohol, so I only had one (is that OK doctor?). I tried the John Hop which is apparently produced from the Best Bitter and when I poured it the smell of real beer certainly excited my nostrils. The taste was not bad but unfortunately not close to the Sussex Best I know and love. The hops were much more evident (hence the name I guess) and the deeper flavours were absent. The beer was served cool and I purposely left a bit in the glass for a while to see what it would taste like at room temperature. The results weren’t great I’m sad to report – a distinctly odd flavour emerging. 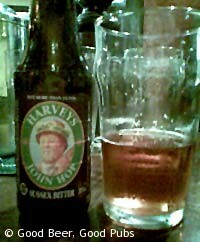 The other Harvey’s beer was called Bill Brewer and is made from the Old Ale. I intend to try this next time I’m in the Royal Oak. No, it hadn’t occurred to me to search out non-alcoholic cider since I very seldom drink any cider anyway. However a chance remark by one of the Wetherspoon’s barstaff at the Crosse Keys in Gracechurch Street led me down that route. They produced a bottle of pear cider by Kopparberg (horrible jumpy website by the way). Whilst this pear cider is on the sweeter end of the spectrum it is very drinkable and the staff at the Crosse Keys were happy to put some real lime into it which helps mask the sweetness a bit. Another great thing about it is that it comes in a 500ml bottle for £1.80 so you can fit more easily into a rounds situation with your mates. Well done Wetherspoon’s! I’m hoping my alcohol-free research won’t have to last much longer but while it does I’ll be searching for alternatives You might have guessed from the last paragraph that I was pleased with the Kopparberg Pear Cider and when in Spoons’ pubs I’ll be drinking that. I may have the Becks Blue where I can find it and I’d like to try the Bitburger Drive at some point. But why is it so hard to get a good non-alcoholic option in a pub? If the UK alcohol driving limit is lowered then far-flung pubs are going to have to try harder to pull people in or they may sink. And the ‘designated driver’ needs some TLC surely. Have any of you found some other interesting alcohol-free options in pubs where you live? Please let me know, comment on this post below. I’m preparing another post on the alcohol-free options that are available in supermarkets. That’ll be published soon. Wow! Thanks. Genuinely good info! have very good flavor. So far in English pubs I have only found Erdinger (at Head of Steam in Durham; it’s also available at Sainsbury’s there.) Beck’s Blue is acceptable, but when one of these weissbiers is available I’ll go for it every time. It seems a bit boring over here for NA beer, yet in Spain there is a huge selection even some of the big players have non alcoholic beers (Amstel, San Miguel), seems if you ask for a NA beer in the UK you are seen as a Social pariah but yet in Spain you are not judged….think the attitude needs to change here! I agree. But things are changing slowly. I’ve noticed that the supermarkets are gradually stocking a greater range of NA beers – Sainsbury’s do a nice NA Czech lager which I but from time to time. But in pubs the choice is still very limited. Re your comments about Spain, the Portuguese also do some good NA brands too. Check out the dark beers from Super Bock and Cheers – they are really good. I really enjoy non alcaholic wheat Bavarian larger its so tasty, its so like having a proper larger its lush. Pubs should sell it you can get 6 x 330ml bottles at Morrison at mo for £2 that’s excellent! Hi Sharon, glad to hear it’s not just me who loves that one – although I did have a batch a while ago that was awful. Morrisons is pretty solid on stocking that one I notice. Do you like the ‘ordinary’ Bavarian 0.0 too. I think that’s pretty good too. I have recently given up alcohol due to health reasons. I am a man who likes to socialise and have a pint in my hand, but I have become astounded at the variation in prices for alcohol free lagers in different pubs. The ones I have tried are all 0.0 % least expensive 2 bottles £3.00 2 bottles £4.40 and 2 bottles £5.60. With the police and thief drunk driving campaigns I am amazed these pubs are allowed to charge these prices. I live in the north west of England and I feel in a local pub £3.00 is acceptable as is the cost of a normal pint of beer anything above is day light robbery. The only two “alcohol-free” beers I have found in pubs are Beck’s Blue and Erdinger both of which taste as they should for a lager and a wheat beer, if you like that sort of thing. I don’t. The Beck’s contains 0.01% alcohol and the Erdinger 0.1%, I believe. Beck’s is often but not always available, Erdinger rarely. Both are there in Wetherspoons and they run an offer of 3 Beck’s for £5. Everywhere else Beck’s ranges from £2.50 for a small bottle up to £3.80 around the East Midlands – in other words £5 to £7.60 per pint. Ridiculous. With government crackdowns on drinking you would think that it would insist on these drinks being available as low-cost options in pubs but not so. Government wants to be seen to “do something” but does not want to cut back its take in alcohol tax. Rapacious big brewers claim they need to charge so much because of the (“look,I’m really a premium beer”) packaging and the low uptake to be stocked for. Only legislation will change this. Brewers and pubs should give their marketing guys a prod – there are profits in enticing drinkers with 2% abv lower-cost beers, not least those of us who see no point in bringing families out to eat in modern pub glorified cafes if our end of the deal is £20-£30 for 4 tasteless pints or a string of overpriced sugar drinks and stomach-stripping Coke. Tried grannys state brewed by brewdog its non alcoholic craft beer (0.5% actually). Really liked it. Found in brightons pub called fortune of war. Becks blue in my region varies from £3.50 per pint to £6.00 per pint, outrageous when Tesco sell it at £1 per pint retail. I have got into “St Peters Without” not too bad, but not quite a pint in a bottle. Thanks for the comment Andy. I too quite like the St Peter’s Without. I got some bottles, and once had it on draught at the Jerusalem Tavern in Clerkenwell, London. Erdinger low alcohol beer is fantastic, so much better than Becks blue which seems to be the market leader in pubs. Supermarkets have so much choice of LA beers, I wish more of them would replace Becks Blue in the pubs.